Siam Niramit dinner show production Phuket. Other than the spectacular show, do come early because there are lots of activities that you can see and do. Not only will you enjoy but you will learn more about the Thai ways of life in bygone times which is not easy to find nowadays. Take a tour of the Thai Village and see the different rural lifestyles across the Four Regions of Thailand in bygone times. Enjoy a glimpse of traditional lifestyles, arts and craft of rural Thailand. Siam Niramit show and production here in Phuket has to be one of the most amazing show we have ever seen. 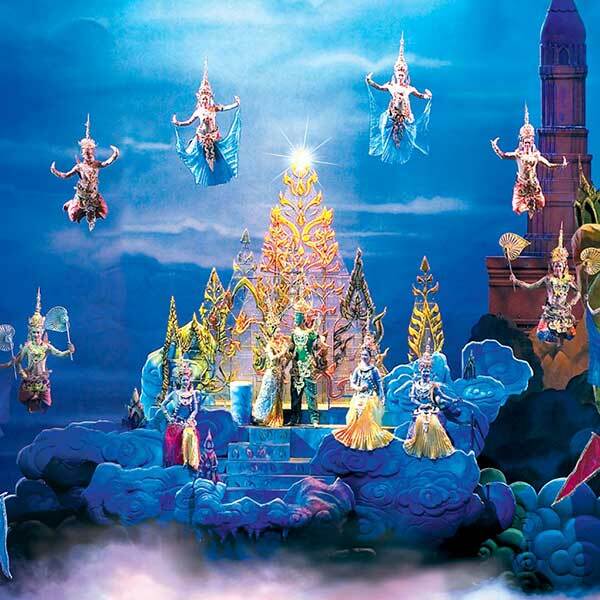 If you are here in Phuket, this is a “Must See”, you really need to book yourself and your family and and go to see this absolutely amazing show and a performance. So much colour, so much vibrance, it is a beautiful journey back in time into Thailand’s past, and back to the days when it was Siam. Child (Infant) or under 4 years of age or less than 90 cm. is free of charge, and must be accompanied by an adult and share a seat with a parent. All the above rates for Children apply to those either between the age of 4-12 years or less than 140 cm. Can get child price. Showtime is at 20.30 pm. daily except Tuesdays. The additional show will be announced in advance. Dinner is seved from 18.00 pm. to 20.00 pm. daily except Tuesdays.